Similar to the Guru Guides, the What They're Watching (WTW) area of TiVo Central Online attempts to refer programming recommendations from known celebrities. TiVo claims that this is based on what is currently in the celebrity's Now Playing List, although based on the slow rate of change of the listed shows, we're fairly certain that these are static lists rather than dynamic updating options. 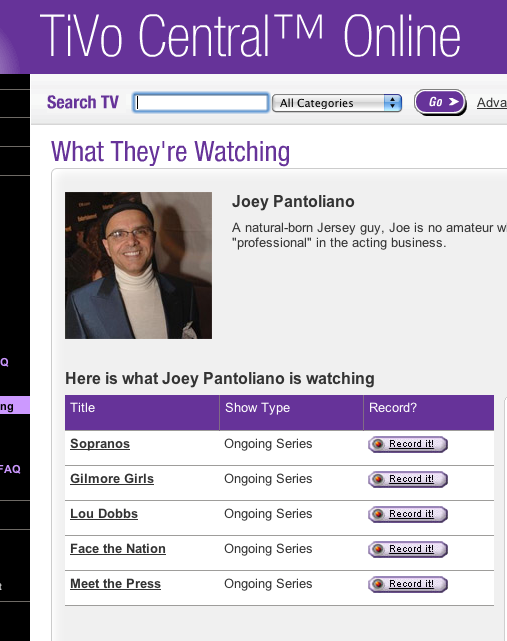 The WTW portion of the tivo.com website first presents the use with the list of current celebrities who are part of the program. Then, when the user selects a celebrity, a list of the celebrity's picks are presented. Next, TCO presents the user with the typical screen showing a program, its upcoming airings, and the ability to record individually or to get a Season Pass. Universal Replacement TiVo Remote - $29.99! (c) 2009-2019 Slimvac Inc. All rights reserved. Any chart on this website may be reproduced in its entirety (and only in its entirety), if and only if a live link to this website (eg. Source: http://www.tivopedia.com) is included at the bottom of the chart. For TiVo repairs and TiVo parts, please visit WeaKnees - the TiVo Superstore.